Assess the resonance frequency of the RLC circuit connected according to the picture. Realize the rules for a circuit in resonance and how does the state of resonance influence the value of the complex impedance (and admittance). 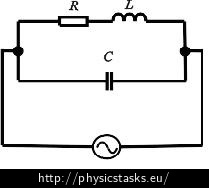 If the circuit is in resonance, the phase shift between the voltage and the current in the circuit is zero. This zero phase shift induces that the imaginary components of the complex impedance and admittance are also zero. Realize if it is easier to express the total impedance or the total admittance of this RLC circuit. For the calculation it will be easier to express the total admittance of the circuit because we can obtain it as a sum of the particular admittances of the individual circuit branches. Note: Admittance is equal to the reciprocal value of impedance. We express the total admittance of the circuit as the sum of the reciprocal values of admittances of its individual branches. The resonance frequency is the frequency at which the current and the voltage are in phase. This means that we get its value when the imaginary component of the total admittance is zero. The current and the voltage in the circuit must be in phase at the resonance frequency. That means that the imaginary component of the complex admittance Y must be zero. where YC is the admittance of the conductor and YRL is the admittance of the inductor and resistor in series. where ω is the angular frequency and L is the inductance of the inductor and j is the imaginary unit.